The original recipe states to use a 120g yogurt pot however I could only find 150g pots – I’m not sure if it’s a mistake. I used my 150g pot and it didn’t seem to affect the final result. 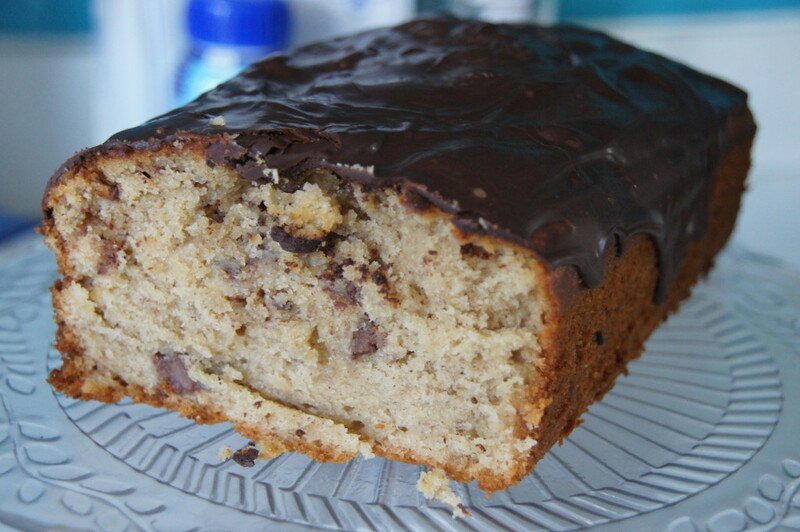 You will need a 1 litre loaf tin for this recipe. Having got half way through my cake I discovered it wasn’t quite cooked through even though a skewer had come out clean so I recommend thoroughly checking it is properly baked. 1) Heat your oven to 170°C/150°C fan/gas 3. Lightly oil and line a 1 litre loaf tin with a long strip of baking paper that hangs over the sides. 2) Put the yogurt in a large bowl, stir in the oil and sugar, then whisk with a balloon whisk until smooth. Whisk in the eggs, one at a time, then the flour and spices, bananas, milk chocolate and a pinch of salt. 4) Remove from the oven. Cool in the tin for 5 minutes. Ease out of the tin using the paper to help. Cool completely. 5) Melt the dark chocolate in the microwave for 30 seconds with a small knob of butter or drizzle of sunflower oil. (You may need to heat more than once and give it a good stir.) Pour the melted chocolate on top of the loaf and smooth with a spoon. Leave to set for 30 minutes, then slice.